when using System.Net.WebClient.DownloadString(String address) against www.foo.com with a certificate for www.bar.com but with www.foo.com listed in the Subject Alternative Name field. The certificate is issued by GoDaddy so Chrome and Internet Explorer consider the certificate valid when going to www.bar.com but also have no problems with the certificate when going to www.foo.com. I think this should be a valid certificate for WebClient because the domain is listed in the Subject Alternative Name field, is this correct? Or does WebClient not use Subject Alternative Name field for SSL certificates issued to one site but used on another site? ... this should be a valid certificate for WebClient because the domain is listed in the Subject Alternative Name field, is this correct? Additionally, there should be no DNS names in the CN. Placing a DNS name in the CN is deprecated by both the IETF/RFC 6125 and the CA/Browser Forums. You should put a friendly name in the CN because it is presented to the user. You should put the DNS names in the SAN. The best I can tell, connecting to www.foo.com with CN=www.bar.com and SAN=www.foo.com is OK per RFC 6125, section 6.4.4; and its OK per CA/B's Baseline Requirements section 9.2.1 and 9.2.2. For the guesses above, Chrome and Internet Explorer could be more tolerant than WebClient.DownloadString. If (3) is the issue, then WebClient.DownloadString is actually correct. In the signing hierarchy below, the attribute encoding of the certificate's Issuer DN must be the same encoding as the signer's Subject DN. You can't mix and match them. The graphic above was shamelessly ripped from Peter Gutmann's Engineering Security. Its freely available online, and it will teach you a lot of interesting security related things. He especially likes poking holes in PKI and offers two chapters on its real-world failures in practices. Not the answer you're looking for? Browse other questions tagged .net security ssl or ask your own question. 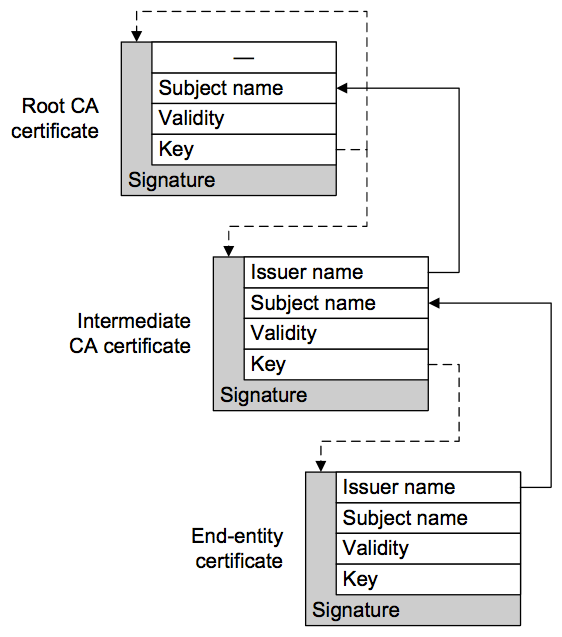 Why getting Could not establish trust relationship for the SSL/TLS secure channel with authority?